Suprenza® is a new diet pill base launched in 2012 by Akrimax Pharmaceuticals, a New Jersey based company. Suprenza® is an orally disintegrating tablet (ODT) which is a true innovation in the world of phentermine diet pills. Suprenza® is a peppermint flavored orally disintegrating tablet that dissolves on your tongue, and can be swallowed with or without water. Because it dissolves on your tongue easily and can be taken without water, it is more convenient than other phentermine tablets and can be taken any time, after, before or during your meal. You must just make sure to avoid taking Suprenza at night if you want to sleep well. Other Phentermine forms must be taken one or 2 hours before your meals. What does Suprenza look like? 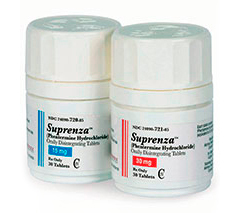 Suprenza is currently sold in two dosage forms and strengths. The 15 mg ODT is a yellow with blue spots round tablet embossed with AX4 on one side, equivalent to 12 mg phentermine base. The 30 mg ODT is a yellow round tablet embossed with AX7 on one side, equivalent to 24 mg phentermine base. Suprenza 15 and 30 mg ODT are packaged in bottles of 30 and 100. What is Suprenza prescribed for? Suprenza is an appetite suppressant prescribed for the excessively overweight who also suffer with a condition such as diabetes, high blood pressure or high cholesterol. To class as a suitable candidate for Suprenza someone must have a BMI of 27+. Suprenza is an appetite suppressant and like all phentermine diet pills, Suprenza works by affecting parts of the central nervous system which effectively suppress the feeling of hunger. Because it is chemically close to amphetamines, Suprenza increases levels of energy within patients, which can be expended through exercise. Suprenza is designed to be used in combination with a healthy diet and regular exercise. Because Phentermine Hydrochloride can be habit forming, Suprenza can only be prescribed for a short period of time, usually a few weeks. A change in eating habits and exercising are essential to maintain the weight loss results. Suprenza is a prescription drug. Suprenza is classed as a controlled substance (Class IV) with the US and is only available on prescription. It is not available in the European Union. Because it contains Phentermine Hydrochloride, Suprenza can also be habit forming and it should only be taken by the patient it was prescribed for. Recommended Suprenza dosages and administration. Dosage should be individualized to get the best response with the lowest effective dose. Your physician will define the right dosage for you. The usual dose (for an adult) is one tablet per day taken in the morning with or without food. What precautions should be taken before using Suprenza? If you are allergic to phentermine or any other medications. If you have ever suffered from a heart condition, high blood pressure, arteriosclerosis, overactive thyroid, diabetes, glaucoma or have a history of drug abuse. If are pregnant, planning to become pregnant, or are breastfeeding. If you become pregnant while taking Suprenza tell your doctor. If you are subject to agitated states. The least amount feasible of Suprenza should be prescribed at one time in order to minimize the risk of overdosage. Overdoses of Suprenza can have serious consequences, if quantities are high enough this can include death. If an overdose is suspected seek medical help immediately. Symptoms of overdosage can include: restlessness, tremor, hyperreflexia, rapid respiration, confusion, assaultiveness, hallucinations, panic states, fatigue, depression, arrhythmia, hypertension or hypotension, circulatory collapse, nausea, vomiting, diarrhea, abdominal cramps.